I have a terrible habit of grinding my teeth at night when I sleep and only found out about it in recent years. So I started reading up about it on WebMD and realized that it can be caused by stress, abnormal bite or crooked/missing teeth. I’m pretty sure mine is caused by my abnormal bite as my upper and lower jaw doesn’t line up symmetrically. What Botox does on the jaw muscles is that it paralyses those muscles and stop them from being active and they will shrink back to original size after a month or so. And I will start seeing results after 2 weeks. 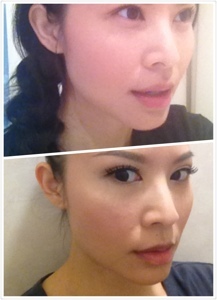 I took photos of myself yesterday before I got the Botox jabs and today 24 hours after receiving it. There was no obvious change in the size of the muscles but I did notice that my jawline does look slightly “softer” as compared to yesterday. Not as tense. And the best thing is… No aching jaw this morning!!! After reading on about teeth grinding I learnt that it can get quite serious to the extent that the teeth are worn down to stumps and serious after effect will be felt when I’m old. So from now on, I’m gonna rely on that uncomfortable bite guard & hopefully prevent any detrimental damage to my teeth & jaw! No pain, no gain right? If you are having the similar problems as me, do consider doing Botox on the jaw muscles to shrink them back to normal & buy a bite guard! Botox on the jawline at DermaCare costs SGD$1000/session and the effects can last till about a year or even longer with the bite guard. Dr. Kwan also shared with me that after about 2 weeks where the effects of the Botox will be more visible, that DermaLift might be required to tighten up the skin around the cheekbone area after the muscles shrink and skin might look looser. But this is dependent on individuals and how elastic your skin is. DermaLift is the injection of small doses of Botox on the skin level to create a tightening of skin and give a “mini face lift”. This treatment is highly popular amongst brides who want to look their best on their BIG day! 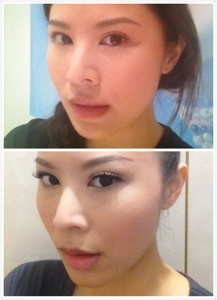 For DermaLift it’s SGD$600/session. And if you want this lift to be long lasting, Dr Kwan recommends 3 sessions of this. If you are interested in trying this out, do give Dr Dennis Kwan a visit at their Ion Orchard clinic. I simply can’t wait to see some results after 2 weeks! More photos then!